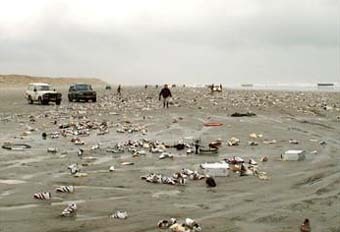 Last night a Liberian cargo ship off the coast of the island of Terschelling lost dozens of containers in a heavy storm. 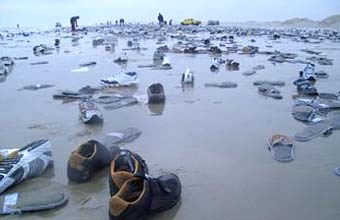 The Dutch island’s beaches are now littered with stuff; the lost containers reportedly contained shoes, hammers, corned beef, aluminum suitcases, toys and … hamburgers. The police of the mainland town of Harlingen has sent a ‘mobile unit’ to the island to assist the island’s police force in preventing people from stealing the Liberian hamburgers. The 335-meter P&O Nedlloyd Mondriaan, for you trivia-fans out there the largest container ship ever built in Japan and P&O Nedlloyd’s first 8,450 teu vessel, sailed under the Liberian flag and lost twenty containers around 6:00pm last night. Nine of the containers beached were still closed. A police spokesperson said that no measures would be taken against people that take goods from the beach; their main focus was on salvaging the nine containers that were still intact. This entry was posted on Friday, February 10th, 2006 at 5:14 pm CET and is filed under Life in Holland, Nature, News	with tags . You can follow any responses to this entry through the RSS 2.0 feed. You can leave a response, or trackback from your own site.